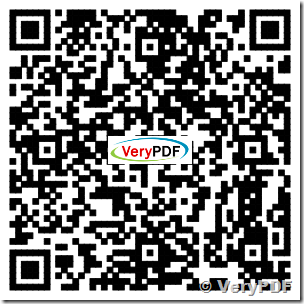 VeryPDF WiFi Disk is a Best Wireless Portable Hard Drive or Wireless Portable Storage. 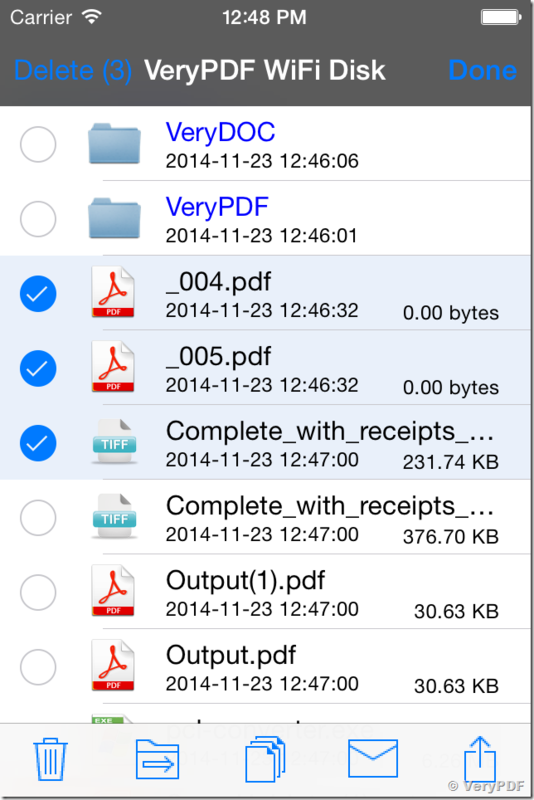 Use your iPhone, iPad or iPod touch as a disk to store, view, and share files. Turn your iPhone into a wireless, mobile external hard drive! Use your iPhone as a normal shared network drive! 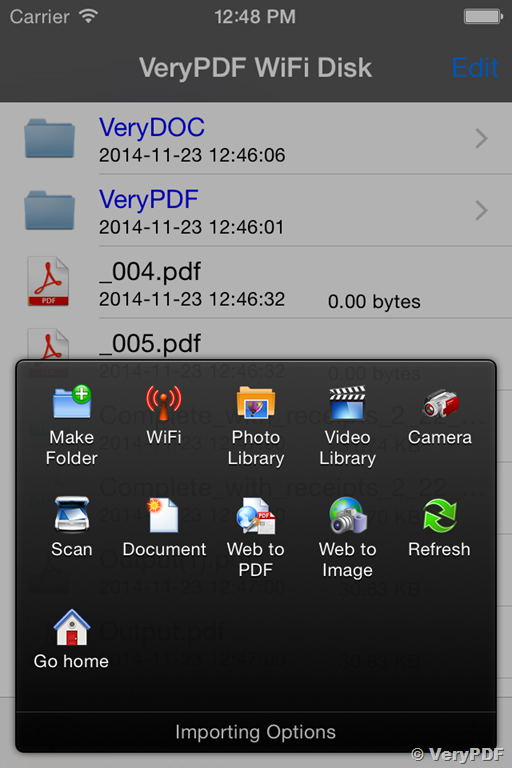 Easily save and view files on your iPhone using just a web browser on any device. No special software is needed, and there is no setup at all, just start WiFi Disk and type the address shown into your web browser. 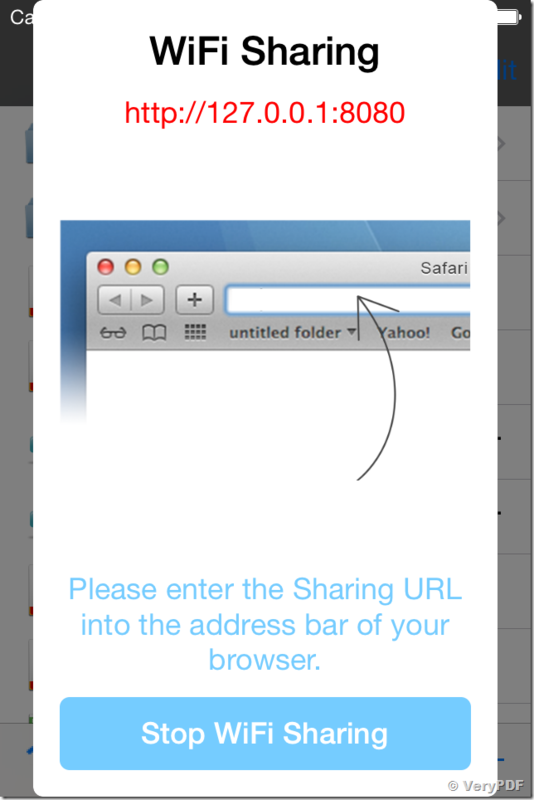 You can use any device or any system with a web browser to view/upload/download the files on iPhone, iPad or iPod Touch. All iPhones, devices, and computers will just need to be on the same WiFi wireless network. 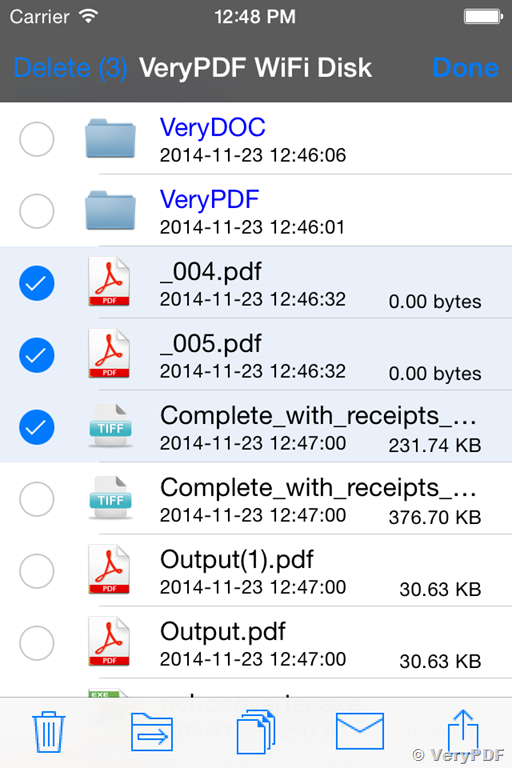 Touch to access your files. All the usual commands are available when managing the files on your iPhone: rename, copy, move, delete, email, send files to another app, and more. 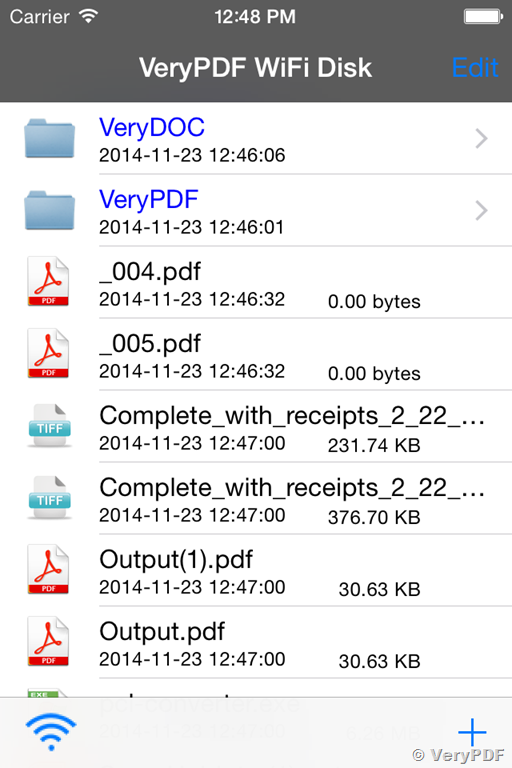 View any file that is supported on the iPhone: images, doc, xls, numbers, pages, pdf, etc. Even edit text or HTML documents with the built-in text editor. 2. Start the WiFi Disk App on iPhone. 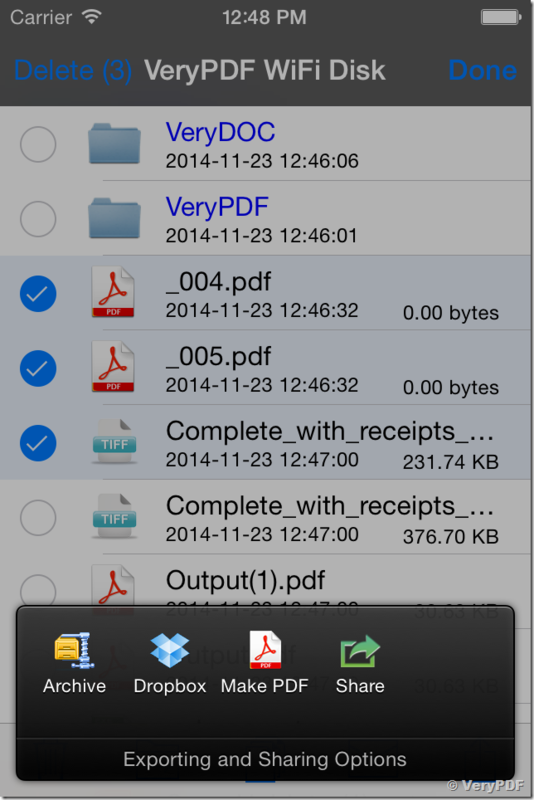 - Share Files Using the built-in HTTP Server. - Works flawlessly with Windows, Mac and Linux systems. - Unlimited Number of Files. 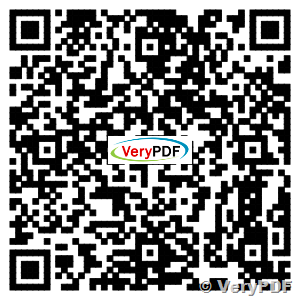 - View any file types: pdf, doc, docx, xls, xlsx, ppt, pptx, tif, jpg, png, bmp, gif, tga, mp3, avi, mpeg, html, txt, rtf, etc. This entry was posted in iOS & iPhone & iPad and tagged ipad, iphone, phone disk, phone driver, wifi disk. Bookmark the permalink.